Cancellation and refund of early registration will not be accepted. 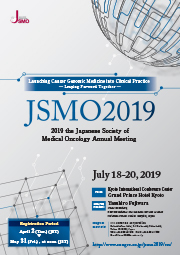 You can check the abstracts for JSMO2019 on the meeting website or mobile application. The password will be placed in program booklet distributed on-site. For student and intern registration, either a student ID or certificate of employment with a seal of department head must be presented at the registration desk on-site. Graduate students are included in "Fellows". Nurses, pharmacists, radiologists, clinical engineers, physiotherapists and occupational therapists are included in Non-industry medical professionals. A three-day pass for city subway will be handed out at the Overseas Registration Desk. Pass holders will be able to freely travel in Kyoto by subway for three days. Special discounted airline ticket is offering to early registrants. As a registered attendee, you can access discounted flights for travel to our conference. We have contracted oneworld® as the official airline alliance. To get the special discount, book your ticket through the oneworld® booking site linked on our top page. Event Code is required for entering the booking site. You can receive it in the confirmation email after completing the registration. Following materials will be provided at the Overseas Registration Desk with your registration confirmation. *Please print out and present your registration confirmation at the Overseas Registration Desk (1F, Main Bldg., Kyoto International Conference Center). Please access to the early registration page from the button below and complete your registration. After completed your registration, you will receive your registration confirmation by email. If you do not receive the confirmation email within 30 min. after the registration, please contact the registration secretariat (jsmo2019-reg@congre.co.jp). Please note that we only accept your registration via online. Registration fees are payable in Japanese Yen only. All major credit cards (VISA, MasterCard, JCB, AMEX and Diners Club) are accepted. Once you complete your registration, no refund will be issued. Publishing your abstract on "Annals of Oncology"
If your abstract is accepted as poster presentation and if you wish to publish your abstract on "Annals of Oncology", you need to pay JPY5,000 per abstract in addition to registration fee. We will inform you the payment details separately later. Acceptance/rejection notice will be sent in the end of May.